Photojojo has unveiled a new compact camera featuring an angled lens for shooting tilt-shift images. The compact camera features a 5 megapixel sensor and is characterised by vignetting, making it akin to shooting with an analogue Lomo or Holga camera. The inbuilt lens is mounted at angle for creating miniaturised effect photos that you would typically get from a standard tilt-shift lens. A tilt-shift lens for a DSLR is one of the most expensive lenses you can buy, typically costing upwards of £1000. Photographers can also use Photoshop to recreate the effect of a tilt-shift lens, or use digital filter effects that come as standard on several modern compact cameras. Photojojo's tilt-shift camera also comes with a flash, 8x zoom, "exposure control", white balance and also has the capability to shoot tilt-shift video at 15fps. Equipped with 16MB of internal memory, there's also an SD card slot and USB connection. A 2.4inch LCD display can be found on the back of the camera, while a standard tripod mount is also included. A range of shooting modes can be used including vivid, sepia and monochrome. The Photojojo Tilt-Shift camera is available for $149 (c. £91) from the Photojojo store. 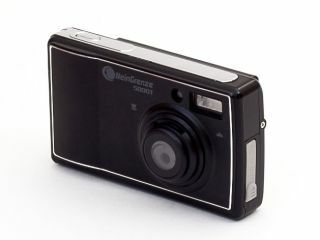 Photojojo is an American company which manufactures and sells unusual cameras, accessories and photography-related gifts.